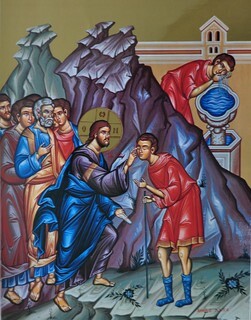 The Gospel of the healing of the man born blind (John 9) is in our Orthodox Church read as one of the Post-Paschal Sunday lessons. Like many of the Gospel Lessons in this period of the Pentecostarion, it is related to the theme of baptism – the lesson begins with a discussion of sin, the blind man then washes in the pool of Siloam and he is healed, and he comes to a full faith in Jesus as the Son of God. The theme of the new creation is an idea we find in the New Testament, an idea which grew in Christianity as the work of Christ was considered. 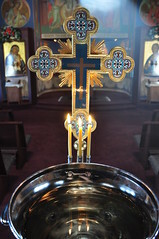 For the Christian tradition in the Orthodox East understood Christ the Word of God to be the one who created the world in the beginning (Psalm 33:6 – “By the word of the Lord the heavens were made…”), and by His presence on earth as Jesus Christ to be renewing that fallen creation. Christians participate in the new creation through their own baptisms. Fashioning flesh and giving light to the eyes. 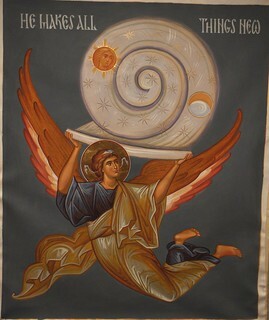 Just as the Word of God created the first human from the dust of the earth, so Jesus the incarnate Word takes the dust of the fallen creation, mixes it with His spittle and anoints the eyes of the man born blind, creating for him new pupils so that for the first time the man born blind could see.